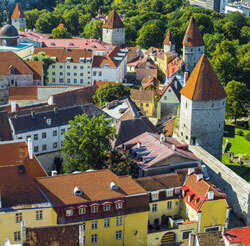 Estonia (photo): This lovely nation, once part of the USSR, borders on the Baltic Sea and Scandinavia and has elements of both. Unlike some bargain destinations, it has all the amenities and infrastructure – including wireless – of other eurozone countries. But because it is relatively “undiscovered,” it is less expensive and less crowded. Ho Chi Minh City and Hanoi, Vietnam. Ho Chi Minh City, formerly Saigon, and Hanoi are among the least expensive places to travel in Asia. About $20 a day will cover food, lodging and seeing the sights, and let you experience Vietnamese culture firsthand. East Africa. Tourists worried about ebola have been canceling visits to West Africa. But East Africa is far from any outbreaks. This is a great time to get some excellent deals on travel to places like Kenya, Uganda and Tanzania. Your activity options range from exceptional beaches to visits with gorillas. New Mexico, USA. This is an excellent destination winter or summer. There are plenty of outdoor activities year-round. And if you get tired of hiking or skiing or exploring, stop for a bite: New Mexico is a new favorite of foodies. Bosnia and Herzegovina. Unlike more famous European destinations, Bosnia and Herzegovina still has inexpensive dining and hotels – and relatively fewer crowds. You can enjoy outdoor activities like skiing and whitewater rafting, and visit historic cities like Sarajevo and Mostar. Galicia, Spain. Much less traveled than the rest of Spain, this destination in the northwest is mostly unspoiled – and spectacular. You also can enjoy a variety of delicious meats and seafood in the many tapas bars. A great lodging option is renting a house or apartment. Quebec City, Canada. If you want to go to Europe but you don’t have the money or are worried about your safety, Quebec City is the next best thing. The streets and building are old, the people speak French, the bistros offer delicious food and drink -- all without leaving North America. Caribbean Coast of Costa Rica. This area is less developed – and therefore less crowded and less expensive – than some other, better-known destinations. But it still offers much of what makes Costa Rica so attractive: beaches and amazing wildlife. And a sloth sanctuary. Timor-Leste. This Asian destination is not for the timid traveler. But the adventurous types can stay in inexpensive beach cottages and homestays both on the ocean and in the hill country. Western Australia. You can visit the city of Perth, or you can wander through the other-wordly landscapes in the outback. Attractions range from rocky coasts to local wineries.